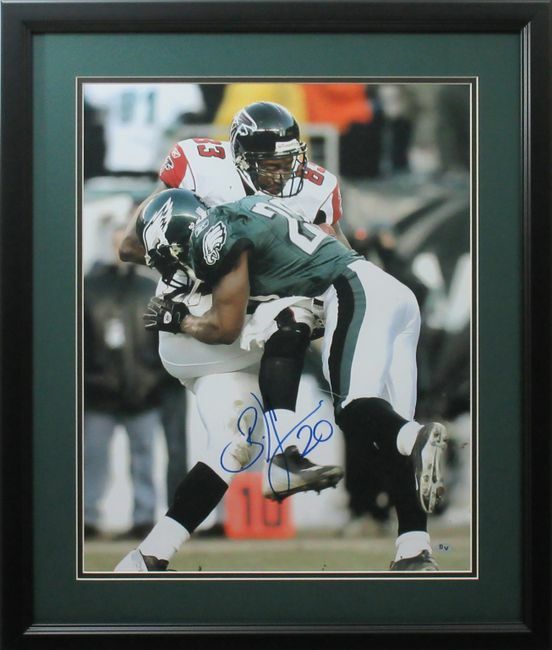 Brian Dawkins Autographed Framed 16x20 Philadelphia Eagles "Hit on Crumpler"
Brian Dawkins, after starring at Clemson University, became a 9-time Pro Bowl Safety for the Philadelphia Eagles. The heart and soul of the Eagles defense that went to five NFC Championship games and represented the NFC in Super Bowl XXVIII. On September 30, 2012 the Philadelphia Eagles retired Brian's number 20 at a halftime ceremony. Brian became only the 9th Philadelphia Eagle to have his number retired in franchise history. This photo is personally autographed by Brian Dawkins, is professionally matted and framed and comes with a Sports Vault Certificate of Authenticity.